The White House released its budget proposal this week, and the numbers are more of the same: huge cuts to popular programs like food stamps, Medicare, and Social Security, and a huge boost for military contractors — all while driving up the deficit. Policies like that are just a few of the reasons Jim Hightower argues the president’s populist posturing has long been a feint. He reports this week on a new Public Citizen pamphlet that lays out the charges in greater depth. We might as well add to that list a proposed Labor Department rule that would let employers vacuum up the tips you leave for your servers. That means instead of tipping your bartender or waiter, you might end up tipping some corporation’s already overpaid CEO, as Irene Tung and Teófilo Reyes explain this week. Included in that new budget proposal is a long-awaited infrastructure plan, which critics say amounts to little. But one thing it would do is restrict environmental reviews of new projects. 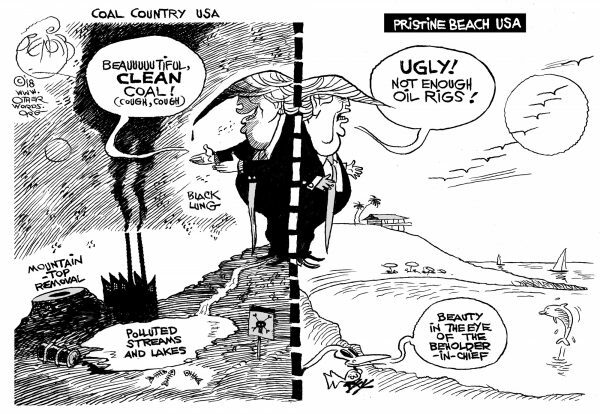 Combined with the administration’s plans to open up drilling off the nation’s beaches and you get quite a cartoon from Khalil Bendib. We’re a little light this week while we tend to some institutional housekeeping, but we’ll be back with a full slate too. Meanwhile, if you need more, check out last week’s op-eds: There’s Josh Hoxie on how working families get no love on this Valentine’s Day, Alison Stine on how fracking companies are dumping on her corner of Ohio, and Jen Herrick on the ongoing GOP effort to prevent people from voting. The Trump administration wants servers to hand over nearly $6 billion to their bosses. Jeff Sessions, who opposes safe medical marijuana, says severe pain sufferers should “tough it out” instead. A handy new pamphlet counts the president’s lies and attacks on the working people he duped into supporting him. The post In OtherWords: February 14, 2018 appeared first on OtherWords.